Bought from Hotspur in 1981. H. Cescinsky, English Furniture of the Eighteenth Century, 1911, vol. III, p. 165-166, fig. 179-180. The London cabinet-makers Mayhew and Ince are particularly well known for their use of the foliate wreath handle. In 1782 they supplied a satinwood 'Secretary' to Lady Palmerston for Broadlands, Hampshire with foliate wreath handles that also appear on a satinwood bedroom commode they made for Broadlands (H. Roberts, 'Towards an English Louis Seize, Furniture at Broadlands, Hampshire - II', Country Life, 5 February 1981, pp. 346-347, fig. 1). 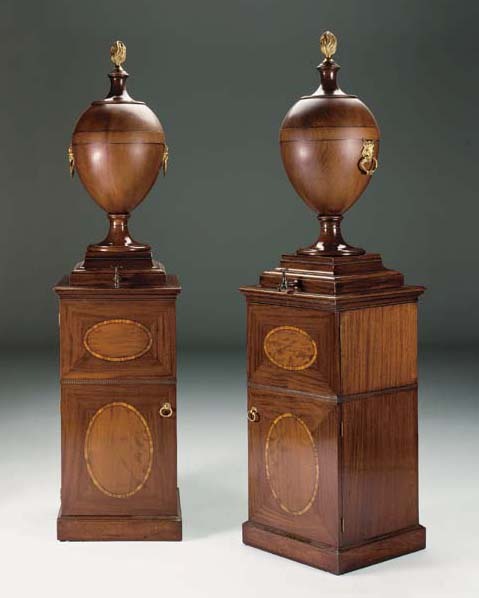 A closely related pair of urns and pedestals, attributed to Mayhew and Ince, was with Pelham Galleries, London.